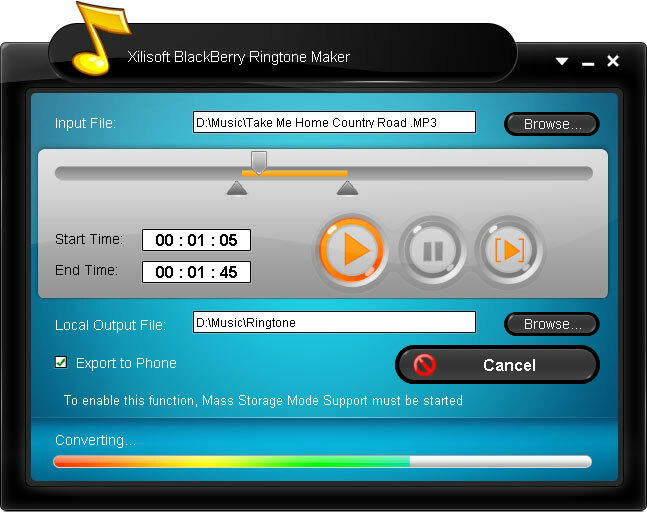 Xilisoft Blackberry Ringtone Maker provides an easy-to-handle way to create your own Blackberry ringtone from any video/audio in your multimedia collection. Xilisoft Blackberry Ringtone Maker supporting a large range of video and audio formats like AVI WMV DivX MP4 3GP WMA WAV M4A etc. the Blackberry Ringtone Maker is not only a ringtone maker but also a ringtone transfer to transfer the converted MP3 file to your Blackberry device automatically. ...... automatically when the conversion is finished as you like. 2. To ensure the music to be converted is what you want, you can pre-listen to the music with the built-in player before converting to MP3. 3. With the user-friendly interface, you will find that making Blackberry ringtone by this MP3 ringtone maker is so simple: just adding a file and converting it! 4. For different mother-tongue users, Xilisoft Blackberry Ringtone Maker provides multiple interface languages: English, German, Japanese and Chinese. Xilisoft Corporation focuses on the users' experience all along, offering the most easy-to-use software and consummate service. just download Xilisoft Blackberry Ringtone Maker to have a try! Qweas is providing links to Xilisoft Blackberry Ringtone Maker 1.0.12.0531 as a courtesy, and makes no representations regarding Xilisoft Blackberry Ringtone Maker or any other applications or any information related thereto. Any questions, complaints or claims regarding this application Xilisoft Blackberry Ringtone Maker 1.0.12.0531 must be directed to the appropriate software vendor. You may click the publisher link of Xilisoft Blackberry Ringtone Maker on the top of this page to get more details about the vendor.